As a NAVSEA-S9320-AM-PRO-030 approved supplier for over 10 years, A&A Coatings has a dedicated team of non-conductive coating (NCC) professionals to ensure that you receive your coated products on time along with the most competitive pricing in the industry. We have been awarded multiple large contracts for the non-conductive plasma coating of submarine electrical connectors, and these successes have firmly established A&A Coatings as the foremost supplier of NCC coatings to the U.S. Navy and its contractors. Additionally, A&A applies a range of other non-conductive ceramics such as Aluminum-Oxide (Alumina) which are widely used in industry to electrically insulate coatings. 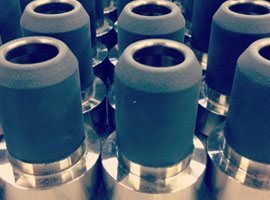 The purpose of applying non-conductive coatings to submarine outboard connector metal plug bodies is to reduce or eliminate cathodic delamination of the polyurethane overmolding from the connector metal plug body. Cathodic delamination, or galvanic action in this area, causes separation of the polyurethane overmolding/strain relief from the connector metal plug body. This delamination eventually provides an entry point for water to enter the connector causing premature connector failure. The cathodic delamination or galvanic action occurs when the connector metal plug body, attached to a hull fitting or an outboard component, becomes electrically active as a part of a galvanic couple. The presence of zinc anodes near the connector metal plug body may also increase the galvanic couple activity. Plasma spraying a non-conductive ceramic coating onto a connector metal plug body is the latest, and perhaps best effort to eliminate galvanic action at this interface area. A&A Coatings is proud to be a NAVSEA-S9320-AM-PRO-030 approved supplier that is highly recognized for our quality non-conductive coatings. If you do not find your part numbers in the above list, it does not mean that we cannot coat them. For further verification, do contact us and make an inquiry.